AAR, is a leading provider of aviation services to the worldwide commercial aerospace and government/defense industries. AAR combines a close-to-the-customer business model with a broad menu of capabilities to help customers operate more efficiently, lower costs and maintain high levels of quality, safety and service. AAR is a financially stable, dedicated partner with an enduring commitment to innovation, execution, continuous improvement and customer value. Customers rely on AAR for logistics, distribution, component repair, inventory management and leasing solutions that reduce costs and increase aircraft availability. 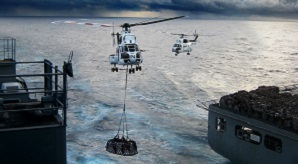 AAR's Expeditionary Services businesses supply shelters, command and control (C4) systems, cold chain containers, and airlift operations for military and humanitarian missions.